After nearly six weeks, two vehicles carrying three tons of gear crossed the border into the United States from Mexico yesterday, officially ending the 2015 expedition of Proyecto Espeleologico Sistema Huautla (PESH). This year’s expedition saw 50 speleologists and support people converge on Huautla de Jimenez, Oaxaca, Mexico area from ten counties; the United States, Mexico, England, France, Germany, Poland, Switzerland, Austria, Romania, and Australia. First discovered in 1966 by Texas cavers, Sistema Huautla is the deepest cave in the Americas and the 8th deepest cave in the world at 1,545 meters (5,068 feet) deep. As part of the 2015 expedition, which carried the The Explorers Club flag, cavers explored the upstream sump in Red Ball Canyon of the 700 meter (2,296 foot) deep Sotano de San Agustin section of Sistema Huautla, an area not seen since 1979, and direct aid climbed 180 meters (590 feet) vertically beyond it. It continues to go and is still getting bigger. They also discovered a new and potentially extensive new part of the La Greta section of Sistema Huautla. Dubbed Mexiguilla due to its similarity with New Mexico’s Lechuguilla, the area has the best formations yet found in the 44 mile (71 kilometer) long cave system. Working with biologists from Universidad Nacional Autónoma de México (UNAM) and a paleontologist from Mexico’s National Institute of Anthropology and History (INAH), six new species of troglobytic lifeforms were collected and the bones of Pleistocene animals were discovered. Further study is pending. Besides Sistema Huautla, teams explored and mapped small caves in the area in hopes of opening up new sections of Sistema Huautla. Progress was also made with public relations efforts to gain access to unexplored entrances where Mazatec Indians believe cave spirits reside and fear offending them, resulting in their corn not growing well. 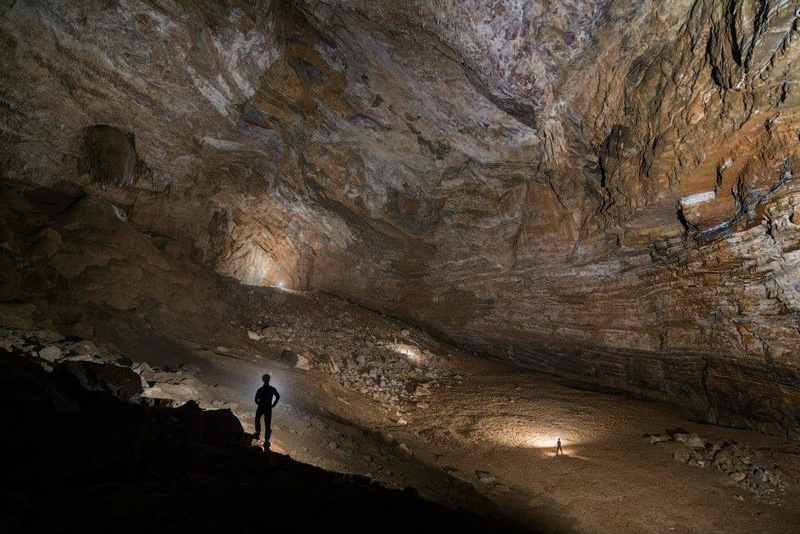 A presentation on the expedition will be made by Bill Steele at the International Session of the 2015 NSS Convention this July, meanwhile six accomplished cave photographers who attended the trip are progressing with a plan to publish a book of photographs. Realmente es muy elocuente y fasinante la información sobre el trabajo realizado por el equipo del PESH en Huautla de Jiménez, Oax. Un saludo a Bill Steele y a todo el equipo de espeleologos , biólogos y paleontolos extranjeros y mexicanos que se han interesado por estas ahora explorables cavernas y que en un futuro vamos a tener la oportunidad de conocer a traves del libro que editará Bill Steele. “It really is very eloquent and fasinante information on the work done by the team of PESH in Huautla de Jimenez , Oaxaca .